Covering Your Favorite African Players and Teams Around The World. Here at Ducor Sports, we believe that it's time to change the sports culture to be more inclusive; to value all athletes regardless of gender. We want to be part of the solution, and to that end we will report on sports in Africa with journalistic integrity and a mission of sports equality. 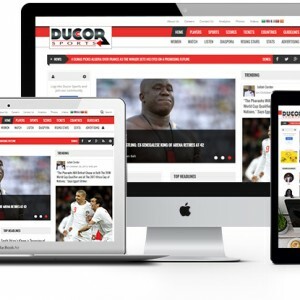 Ducor Sports is a New Digital Media Company for a New Generation. Our Analytics Software-- The business world has been tapping into big data for decades, allowing for more intelligent business decisions. The sports world is beginning to realize the potential of analytics to build and improve teams in a more efficient manner. Our sports analytics software and tools are designed for countries and sports teams who want to make sound recruiting decisions based on data rather than pure instinct. With a team of software engineers, our data visualization tools and ad-hoc reporting allow you to analyze sports data quickly and easily — and in a highly visual manner that clearly illustrates the data.